Don’t Worry About Low Park Power Again!! For use on single phase, 2-wire service. This product is for use on single phase, 2-wire service. 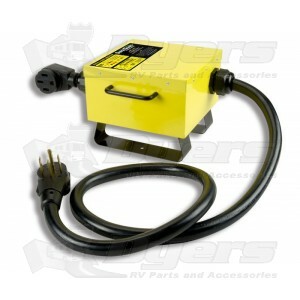 The Voltage Regulator continuously monitors line voltage conditions and increases voltage to provide a very stable regulated and reliable source of power to the coach or travel trailer. The unit also helps prevent low voltage damage to appliances. This is a fully automatic Voltage Regulator which makes it very easy to use. An optional mounting bracket is also available for mounting the regulator inside your RV. Boosts as low as 95Volts. Provides a reliable source of power. Helps prevent low voltage damage to appliances. Easy-to-read LED Status and Fault Indication Panel. Fully automatic – Continuously monitors line voltage conditions. True bypassmode – input voltage is equal to output voltage. Increases voltage to an acceptable level. Mounting feet so unit does not sit in water. Use it to stabilize RV Park power and your good! I received the product within 36 hrs via standard shipping. We have been using the regulator for a month now in all kinds of wind and rain on the Oregon coast. A quick glance as you walk by and you see the status of the power to your RV. We are very happy with the regulator. Like buying insurance for your RV. Could save you from replacing circuit boards in a/c units, fridge, etc. which would run you hundreds of dollars and lots of time and frustration. BE SURE TO FOLLOW SET UP PROCEDURES and also use a surge guard. There is an auto by-pass feature if the voltage becomes too extreme and without a surge protector your rig is toast! FROM THE MANUAL: "CAUTION: Power conditions may be acceptable during initial plug in; however, ongoing line conditions may change during prolonged operation, therefore, it is recommended that a TRC Surge Guard RV Power Protection device be installed in conjunction with the (SGVR) to provide maximum protection as well as regulated power. The Surge Guard must be plugged in after or down stream of the (SGVR)." Best price on internet,only one to say it protects from surges and regulates too! We in southern MS living out in the country have electricity that has alot to be desired. It flucuates, and goes on and off all times of the year, but especially during the long summer months. We bought this after an expensive dual A.C. replacement, (which our insurance paid mostly for.) We haven't had any bad storms yet so I can't comment on it how well it works. It is very hard to rate the product this soon. Good so far with regular flucuations. It fits in our Class A Fleetwood motorhome inside by the plug-ins, so it is out of the rain/weather somewhat. Like previous buyers would have liked the cord to be longer-25-50 ft. would have been nice. Dyers price the best i found on line. Product cord is too short where it plugs into camper. It is designed to be used at the shore power pedestal with a normal 30A extension cord. I needed to use it next to camper right near plug in. I wanted to keep it chained up under the camper out of the weather.